St Francis Links is another Jack Nicklaus course and what a beauty it is. Typical of the Scottish, undulating courses with humps and swales and hollows it has captured the essence of the great championship layouts of the British Isles. There is something special and exhilerating about playing a good links course and this one is no exception. In the same tradition as Royal Port Alfred, each hole is given its distinctive name, among them “Eye of the needle”; “Braveheart”; and a local African expression “Eish” which could loosely be translated as WOW! The course is aesthetically pleasing and very playable for all types of golfer. Nicklaus, as always, has made wise decisions in working with the superb topography he had at his disposal. 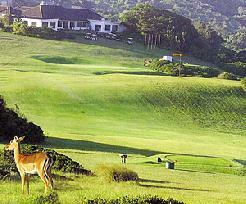 This is a newly established course and we predict it will rise rapidly into the top ten golf courses in South Africa. 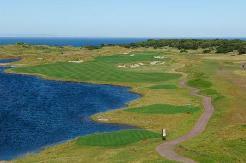 Wind at St. Francis often comes into play, but what would a links course be without it? It adds to the challenge. Ask St Francis Links Golf Director, Jeff Clause, how to play the course, he will give you great advice. You are invited to choose your own Signature Hole - and what a task you will have deciding! Our recommendation is - don’t leave this one off your itinerary. Another Connoisseur’s choice.